For the act of consuming a drink, see Drinking. A drink (or beverage) is a liquid intended for human consumption. In addition to their basic function of satisfying thirst, drinks play important roles in human culture. Common types of drinks include plain drinking water, milk, coffee, tea, hot chocolate, juice and soft drinks. In addition, alcoholic drinks such as wine, beer, and liquor, which contain the drug ethanol, have been part of human culture for more than 8,000 years. When the human body becomes dehydrated, it experiences thirst. This craving of fluids results in an instinctive need to drink. Thirst is regulated by the hypothalamus in response to subtle changes in the body's electrolyte levels, and also as a result of changes in the volume of blood circulating. The complete elimination of drinks, that is, water, from the body will result in death faster than the removal of any other substance. Water and milk have been basic drinks throughout history. As water is essential for life, it has also been the carrier of many diseases. As society developed, new techniques were discovered to create the drinks from the plants that were available in different areas. The earliest archaeological evidence of wine production yet found has been at sites in Georgia (c. 6000 BCE) and Iran (c. 5000 BCE). Beer may have been known in Neolithic Europe as far back as 3000 BCE, and was mainly brewed on a domestic scale. The invention of beer (and bread) has been argued to be responsible for humanity's ability to develop technology and build civilization. Tea likely originated in Yunnan, China during the Shang Dynasty (1500 BCE–1046 BCE) as a medicinal drink. A drink is a form of liquid which has been prepared for human consumption. The preparation can include a number of different steps, some prior to transport, others immediately prior to consumption. Water is the chief constituent in all drinks, and the primary ingredient in most. Water is purified prior to drinking. Methods for purification include filtration and the addition of chemicals, such as chlorination. The importance of purified water is highlighted by the World Health Organization, who point out 94% of deaths from diarrhea – the third biggest cause of infectious death worldwide at 1.8 million annually – could be prevented by improving the quality of the victim's environment, particularly safe water. Pasteurisation is the process of heating a liquid for a period of time at a specified temperature, then immediately cooling. The process reduces the growth of microorganisms within the liquid, thereby increasing the time before spoilage. It is primarily used on milk, which prior to pasteurisation is commonly infected with pathogenic bacteria and therefore is more likely than any other part of the common diet in the developed world to cause illness. Water is the world's most consumed drink, however, 97% of water on Earth is non-drinkable salt water. Fresh water is found in rivers, lakes, wetlands, groundwater, and frozen glaciers. Less than 1% of the Earth's fresh water supplies are accessible through surface water and underground sources which are cost effective to retrieve. Fruit juice 100% Largely regulated throughout the world; 'juice' is often protected to be used for only 100% fruit. Fruit drink 10% Fruit is liquefied and water added. Fruit squash 25% Produced using strained fruit juice, 45% sugar and preservatives. Fruit cordial 0% All 'suspended matter' is eliminated by filtration or clarification. and therefore appears clear This type of drink, if described as 'flavoured,' may not have any amount of fruit. Fruit punch 25% A mixture of fruit juices. Contains around 65% sugar. Fruit syrups - 1 fruit crushed into puree and left to ferment. Is then heated with sugar to create syrup. Fruit juice concentrates 100% Water removed from fruit juice by heating or freezing. Carbonated fruit drinks - Carbon dioxide added to fruit drink. Fruit nectars 30% Mixture of fruit pulp, sugar and water which is consumed as 'one shot'. Fruit Sherbets - Cooled drink of sweetened diluted fruit juice. A sleep beverage, nightcap or relaxation drink are considered consumable liquids taken shortly before bedtime to induce sleep. They are often formulated to help reduce stress, alleviate anxiety, improve focus, and promote better overall sleep. For example, a small alcoholic drink or a cup of warm milk can supposedly promote a good night's sleep. These consumable sleep supplements are an anomaly or antithesis of energy drinks and have found a niche in the beverage industry. Originally, a nightcap was understood to be an alcoholic liquid with purpose of warming the drinker up and helping them sleep. That changed in 1930, when the nonalcoholic drink, Ovaltine, was advertised as "the world's best 'night-cap' to ensure sound, natural sleep." An ingredient of Ovaltine is magnesium which helps to induce relaxation. Likewise, warm milk is often recommended as a nightcap for inducing sleep, because it contains both tryptophan and calcium. Then, the flavor of the warm milk was improved by adding a small amount of liqueur which may promote sleep as well. Alternatively, honey or vanilla can improve the flavor too. The effectiveness of warm milk for inducing sleep is disputed. Other drinks touted for inducing sleep and being effective sleep aids are hops tea, cherry juice (contains melatonin), coconut water (contains magnesium), lemon balm tea, decaffeinated green tea (contains theanine), valerian tea, and chamomile tea. Today, however, most sleep beverages, nightcaps and relaxation drinks are generally non-alcoholic beverages containing calming ingredients normally found in nature. They are considered functional beverages which serve to relax a person. Unlike other calming beverages, such as tea, warm milk or milk with honey; sleep drinks almost universally contain more than one active ingredient. Melatonin is a common ingredient found in relaxation drinks which also carries some negative connotations due to the controversial effects from long term use. Sleep beverages, nightcaps, and relaxation drinks have been known to contain other natural ingredients and are usually free of caffeine and alcohol but some have claimed to contain marijuana. Sleep beverages, nightcaps and relaxation drinks started to reappear in Japan at the beginning of the 21st century and then began to make their way to the US. One major brand was called Drank, a reference to an illicit concoction made out of cold medication. Others had names like Purple Stuff and Lean, which also hinted at vaguely narcotic effects. These brands were marketed towards a partying crowd, yet never managed to break into the mainstream. In the US, the Food & Drug Administration also moved in, shutting down brands for false health claims. Beer is an alcoholic drink produced by the saccharification of starch and fermentation of the resulting sugar. The starch and saccharification enzymes are often derived from malted cereal grains, most commonly malted barley and malted wheat. Most beer is also flavoured with hops, which add bitterness and act as a natural preservative, though other flavourings such as herbs or fruit may occasionally be included. The preparation of beer is called brewing. Beer is the world's most widely consumed alcoholic drink, and is the third-most popular drink overall, after water and tea. It is said to have been discovered by goddess Ninkasi around 5300 BCE, when she accidentally discovered yeast after leaving grain in jars that were later rained upon and left for several days. Women have been the chief creators of beer throughout history due to its association with domesticity and it, throughout much of history, being brewed in the home for family consumption. Only in recent history have men began to dabble in the field. It is thought by some to be the oldest fermented drink. 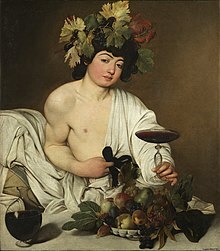 Some of humanity's earliest known writings refer to the production and distribution of beer: the Code of Hammurabi included laws regulating beer and beer parlours, and "The Hymn to Ninkasi", a prayer to the Mesopotamian goddess of beer, served as both a prayer and as a method of remembering the recipe for beer in a culture with few literate people. Today, the brewing industry is a global business, consisting of several dominant multinational companies and many thousands of smaller producers ranging from brewpubs to regional breweries. Spirits are distilled beverages that contain no added sugar and have at least 20% alcohol by volume (ABV). Popular spirits include borovička, brandy, gin, rum, slivovitz, tequila, vodka, and whisky. Brandy is a spirit created by distilling wine, whilst vodka may be distilled from any starch- or sugar-rich plant matter; most vodka today is produced from grains such as sorghum, corn, rye or wheat. Coffee is a brewed drink prepared from the roasted seeds of several species of an evergreen shrub of the genus Coffea. The two most common sources of coffee beans are the highly regarded Coffea arabica, and the "robusta" form of the hardier Coffea canephora. Coffee plants are cultivated in more than 70 countries. Once ripe, coffee "berries" are picked, processed, and dried to yield the seeds inside. The seeds are then roasted to varying degrees, depending on the desired flavor, before being ground and brewed to create coffee. Hot chocolate, also known as drinking chocolate or cocoa, is a heated drink consisting of shaved chocolate, melted chocolate or cocoa powder, heated milk or water, and usually a sweetener. Hot chocolate may be topped with whipped cream. Hot chocolate made with melted chocolate is sometimes called drinking chocolate, characterized by less sweetness and a thicker consistency. Throughout history, people have come together in establishments to socialise whilst drinking. This includes cafés and coffeehouses, focus on providing hot drinks as well as light snacks. Many coffee houses in the Middle East, and in West Asian immigrant districts in the Western world, offer shisha (nargile in Turkish and Greek), flavored tobacco smoked through a hookah. Espresso bars are a type of coffeehouse that specialize in serving espresso and espresso-based drinks. Alcoholic drinks are served in drinking establishments, which have different cultural connotations. For example, pubs are fundamental to the culture of Britain, Ireland, Australia, Canada, New England, Metro Detroit, South Africa and New Zealand. In many places, especially in villages, a pub can be the focal point of the community. The writings of Samuel Pepys describe the pub as the heart of England. Many pubs are controlled by breweries, so cask ale or keg beer may be a better value than wines and spirits. An important export commodity, coffee was the top agricultural export for twelve countries in 2004, and it was the world's seventh-largest legal agricultural export by value in 2005. Green (unroasted) coffee is one of the most traded agricultural commodities in the world. For the calendar year 2016, the United States beverage industry was valued at $24.1 billion with single-serve bottled water accounting for $900 million of the total. Carbonated beverages accounted for $81.6 billion in annual sales in the U.S. Some drinks, such as wine, can be used as an alternative investment. This can be achieved by either purchasing and reselling individual bottles or cases of particular wines, or purchasing shares in an investment wine fund that pools investors' capital. ^ a b Cheney, Ralph (July 1947). "The Biology and Economics of the Beverage Industry". Economic Botany. 1 (3): 243–275. doi:10.1007/bf02858570. JSTOR 4251857. ^ Burnett, John (2012). Liquid Pleasures: A Social History of Drinks in Modern Britain. Routledge. pp. 1–20. ISBN 978-1-134-78879-8. ^ Keys, David (2003-12-28). "Now that's what you call a real vintage: professor unearths 8,000-year-old wine". The Independent. Retrieved 2011-03-20. ^ a b Berkowitz, Mark (1996). "World's Earliest Wine". Archaeology. Archaeological Institute of America. 49 (5). Retrieved 25 June 2008. ^ Ellsworth, Amy (18 July 2012). "7,000 Year-old Wine Jar". ^ "Dreher Breweries, Beer-history". Archived from the original on 2009-07-09. Retrieved 2010-09-21. ^ Mirsky, Steve (May 2007). "Ale's Well with the World". Scientific American. 296 (5): 102. Bibcode:2007SciAm.296e.102M. doi:10.1038/scientificamerican0507-102. Retrieved 4 November 2007. ^ Mary Lou Heiss; Robert J. Heiss. The Story of Tea: A Cultural History and Drinking Guide. ^ a b c Katsigris, Costas; Thomas, Chris (2006). The Bar and Beverage Book. John Wiley and Sons. pp. 5–10. ISBN 978-0-470-07344-5. ^ Combating Waterborne Diseases at the Household Level (PDF). World Health Organization. 2007. p. 11. ISBN 978-92-4-159522-3. ^ "percolate". Merriam Webster. 2008. Retrieved 2008-01-09. ^ Matthew Schaefer (15 Feb 2012). The Illustrated Guide to Brewing Beer. Skyhorse Publishing Inc. p. 197. ISBN 978-1-61608-463-9. Retrieved 13 November 2012. ^ Thomas, Jerry (1862). How To Mix Drinks. ^ Griffiths, John (2007). Tea: The Drink That Changed the World. Andre Deutsch. ISBN 978-0-233-00212-5. ^ Where is Earth's water? Archived 2013-12-14 at the Wayback Machine, United States Geological Survey. ^ Van Ginkel, J. A. (2002). Human Development and the Environment: Challenges for the United Nations in the New Millennium. United Nations University Press. pp. 198–199. ISBN 9280810693. ^ Liu, Nicole (12 March 2016). "China's go-to beverage? Hot water. Really". Los Angeles Times. Retrieved 14 March 2016. ^ Richards, Edgar (5 September 1890). "Beverages". Science. American Association for the Advancement of Science. 16 (396): 127–131. Bibcode:1890Sci....16..127R. doi:10.1126/science.ns-16.396.127. JSTOR 1766104. ^ Steen, Dr. David; Ashhurst, Philip. (2008). Carbonated Soft Drinks: Formulation and Manufacture. John Wiley & Sons. pp. 1–2. ISBN 1-4051-7170-7. ^ a b c d e Sivasankar, B. (2002). "24". FOOD PROCESSING AND PRESERVATION. PHI Learning Pvt. Ltd. p. 314. ISBN 8120320867. ^ "Soft Drink Industry: Market Research Reports, Statistics and Analysis". Report Linker. Retrieved 10 June 2013. ^ a b c d e f g h i j k l m n o p q r Srilakshmi, B. (2003). Food Science (3rd ed.). New Age International. p. 269. ISBN 8122414818. ^ a b Ashurst, Philip R. (1994). Production and Packaging of Non-Carbonated Fruit Juices and Fruit Beverages (2nd ed.). Springer. pp. 360–362. ISBN 0-8342-1289-7. ^ a b Cooper, Derek (1970). The Beverage Report. London: Routledge & Kegan Paul Ltd. p. 55. ^ a b c Chandrasekaran, M. (2012). Valorization of Food Processing By-Products. Fermented foods and drinks series. CRC Press. p. 595. ISBN 1-4398-4885-8. ^ a b Desai (2000). Handbook of Nutrition and Diet. Food Science and Technology. CRC Press. p. 231. ISBN 1-4200-0161-2. ^ Arnold, John P (2005). Origin and History of Beer and Brewing: From Prehistoric Times to the Beginning of Brewing Science and Technology (Reprint ed.). BeerBooks.com. ^ Hamill, Pete (1994). A Drinking Life: A Memoir. New York: Little, Brown and Company. ISBN 978-0-316-34102-8. ^ "Beer Before Bread". Alaska Science Forum #1039, Carla Helfferich. Archived from the original on 9 May 2008. Retrieved 13 May 2008. ^ "Nin-kasi: Mesopotamian Goddess of Beer". Matrifocus 2006, Johanna Stuckey. Archived from the original on 24 May 2008. Retrieved 13 May 2008. ^ Lea, Andrew. "The Science of Cidermaking Part 1 – Introduction". Retrieved 2 November 2011. ^ "National Association of Cider Makers". Retrieved 2007-12-21. ^ Johnson, H. (1989). Vintage: The Story of Wine. Simon & Schuster. pp. 11–6. ISBN 0-671-79182-6. ^ Keys, David (28 December 2003). "Now that's what you call a real vintage: professor unearths 8,000-year-old wine". The Independent. Archived from the original on October 5, 2011. Retrieved 20 March 2011. ^ Coffee and Health. Thecoffeefaq.com (2005-02-16). Retrieved on 2013-01-22. ^ Villanueva, Cristina M.; Cantor, Kenneth P.; King, Will D.; Jaakkola, Jouni J.K.; Cordier, Sylvaine; Lynch, Charles F.; Porru, Stefano; Kogevinas, Manolis (2006). "Total and specific fluid consumption as determinants of bladder cancer risk". International Journal of Cancer. 118 (8): 2040–7. doi:10.1002/ijc.21587. PMID 16284957. ^ a b Weinberg, Bennett Alan; Bealer, Bonnie K. (2001). The World of Caffeine: The Science and Culture of the World's Most Popular Drug. New York: Routledge. pp. 3–4. ISBN 0-415-92722-6. Retrieved November 18, 2015. ^ Bee Wilson (15 Sep 2009). "Aztecs and cacao: the bittersweet past of chocolate". Telegraph. ^ Trivedi, Bijal (July 17, 2012). "Ancient Chocolate Found in Maya "Teapot"". National Geographic. Retrieved July 15, 2017. ^ Martin, Laura C. (2007). Tea: The Drink that Changed the World. Tuttle Publishing. pp. 7–8. ISBN 0-8048-3724-4. ^ Saberi, Helen (2010). Tea: A Global History. Reaktion Books. p. 7. ISBN 1-86189-892-4. ^ Gibson, E.L.; Rycroft, J.A. (2011). "41". In Victor R. Preedy. 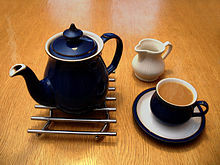 Psychological and Physiological Consequences of Drinking Tea in Handbook of Behavior, Food and Nutrition. Watson, R.; Martin, C. Springer. pp. 621–623. ISBN 0-387-92271-7. ^ Mars, Brigitte (2009). Healing Herbal Teas: A Complete Guide to Making Delicious, Healthful Beverages. ReadHowYouWant.com. pp. vi. ISBN 1-4429-6955-5. ^ Safi, Tammy (2001). Healthy Teas: Green, Black, Herbal, Fruit (Illustrated ed.). Tuttle Publishing. p. 16. ISBN 0-7946-5004-X. ^ Public House Britannica.com; Subscription Required. Retrieved 3 July 2008. ^ "Scottish pubs". Insiders-scotland-guide.com. Retrieved 4 November 2012. ^ Cronin, Michael; O'Connor, Barbara (2003). Barbara O'Connor, ed. Irish Tourism: image, culture, and identity. Tourism and Cultural Change. 1. Channel View Publications. p. 83. ISBN 978-1-873150-53-5. Retrieved 27 March 2011. ^ Todd Dayton, San Francisco's Best Dive Bars, page 4. Ig Publishing. 2009. ISBN 0-9703125-8-X. Retrieved 2010-07-22. ^ "FAO Statistical Yearbook 2004 Vol. 1/1 Table C.10: Most important imports and exports of agricultural products (in value terms) (2004)" (PDF). FAO Statistics Division. 2006. Archived from the original (PDF) on 2008-06-25. Retrieved September 13, 2007. ^ Mussatto, Solange I.; Machado, Ercília M. S.; Martins, Silvia; Teixeira, José A. (2011). "Production, Composition, and Application of Coffee and Its Industrial Residues" (PDF). Food and Bioprocess Technology. 4 (5): 661–72. doi:10.1007/s11947-011-0565-z. hdl:1822/22361. ^ Caronello, Sophie (2018-05-08). "Bottled Water, Soda Provide the Pop in U.S." Bloomberg News. Retrieved 2018-05-09. ^ Greenwood, By John. "First class returns for alternative investments". ^ "Buying wine for investment". IFWIC.org. Archived from the original on 16 January 2012. Retrieved 16 January 2012. Kummer, Corby (August 19, 2003). The Joy of Coffee: The Essential guide to Buying, Brewing, and Enjoying. Boston: Houghton Mifflin. ISBN 0-618-30240-9. 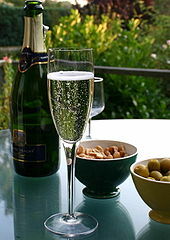 Wikimedia Commons has media related to Drink. Wikivoyage has a travel guide for Beverages.